Many buyers are likely to be nervous about the condition of a horse for sale. It is very hard to ascertain whether a horse has any problems or vices from a viewing that lasts just a few hours. One way of reassuring a potential buyer that a horse is sound is to present a sale agreement in which you warrant (promise) that the horse is fit and doesn't have certain vices. Use of an agreement is likely to present you as a professional and trustworthy seller. If anything does go wrong once the horse is sold, having used an agreement, you are more likely to receive a friendly phone call and the chance to talk through the problem, rather than an immediate summons to court. Using your version of the agreement (rather than a buyer's) allows you to set the conditions of sale. If there are potential problems, you can remove your warranty relating to it without bringing the removal so obviously to the buyer's attention. You can also choose terms around payment and delivery that suit you rather than the buyer. If you present your agreement first, it is more likely to be the one that is used. An agreement transfers much of the risk of buying back to the seller, and so many sellers are reluctant to use them. However, as a buyer, the consequences of not using an agreement could be expensive, both financially and from not having a horse to ride, and so many buyers will insist on using one. If you do use one, it is better from your point of view to use one that benefits you as much as possible, rather than one that transfers all risks to you. Many people think that an agreement is too formal or legalistic, especially when the other side can be trusted. As far as possible, we have drawn the agreement so that both sides will be happy to use it. It should be difficult for the buyer to refuse to use this document on grounds that it appears too technical. For example, our use of plain language (and lack of legal jargon) should ensure both sides understand the agreement, and reduce any worries about what exactly the deal is. If you are the buyer, then you will probably want more provisions that protect you rather than the seller. 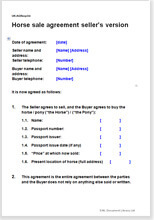 Look at: Horse sale agreement: buyer's version.